Do Dogs Understand Human Perspective? The interpretation of the experiment linked to below, claims to have discovered that dogs understand human perspective. One entertaining and enlightening exercise through which students are taught about Operant Conditioning and its power to shape behavior, is through the game of “Hot and Cold.” A student is asked to leave the room while the class decides on some bizarre action they want to train that student to perform. The student returns and the class simply by indicating hot—warm—cool—cold quickly have this person putting the pencil sharpener into the flower vase upside down on a far desk while he’s trying to scratch his big toe on his left foot. Now this doesn’t fully explain the phenomenon of learning to the extent that the students are led to believe, we still have to ask about internal motive and the drive within the pupil to synchronize and align with his classmates, but what has indeed transpired is that every square inch of room and every possible physical movement has been encoded according to a principle of conductivity, a gradient ranging from hot to cold, or for my purposes let’s say GO or NO GO. This invisible signal guides the student’s mind and body to a precise configuration in relation to his body, other objects and space. Time and space are partitioned into zones of varying intensity–i.e. values of conductivity–within which the student navigates to reduce the sensations of resistance (NO GO). He performs a complex behavior without having any comprehension whatsoever of an observer’s point of view. He has no idea, and need not every grasp the idea, of what he is being shaped to do. This in fact is the point of the exercise, the training subject doesn’t have to comprehend the end game or understand the trainer’s point of view. So here we have on the one hand in modern behaviorism, shaping as a mainstay of learning theory, and now in this interpretation a high cognitive function and a theory of mind is held to be the likely explanation for why a dog is more apt to steal something in the dark. I can appreciate that without practice in an immediate-moment manner of analysis, researchers would not arrive at the interpretation of the experiment I will offer below, but I do expect that they should not immediately leap to a high level cognitive interpretation which by the way is the default setting of the human intellect. They shouldn’t expect to find that animals think just like humans given that the world appears to them on such a primordial and sensory-laden basis. For millions of years organisms have evolved through the prey and predator modality with time and space being partitioned according to a principle of conductivity. An immediate-moment analysis of behavior reveals that nature is not random, there are two primal emotional values and two prime Temperamental traits, Predator and Prey. Every moment of every animal’s mind is catalogued according to this principle of emotional conductivity, that which conducts emotion, GO, relative to that which resists the movement of emotion, NO GO. In every animal’s mind, there is always a predator and a prey value around which their perspective is framed, this is true of every moment. The chief resistance factor is the “predatory aspect” or eyes. This is the main partitioning divide between NO GO and GO because not being eaten has a higher priority than finding something to eat. Being the object-of-attention of a predator is like being a prisoner trying to escape from Stalag 13 caught in the beam of a searchlight while wriggling under the perimeter fence. Meanwhile the preyful aspect is the GO signal meaning that Drive is moving cleanly from input–>throughput–>output. Sensory input is being translated into actions that fully conduct the emotional load of the experience. If not, then the animal experiences compression. A mouse cautiously sticks its head out into the open field. Is it aware of a raptor’s point of view or is it feeling vulnerable? With snow on the ground a deer beds down where it can watch over its track. Does the deer understand the predator’s point of view, or does the snow make it feel vulnerable? Jays have been found to recache their food if they perceive another jay watching it, are they aware of the other Jay’s point of view, or does being watched make them feel vulnerable? Due to these prime emotional and Temperamental values embedded in animal consciousness, the world itself is changed according to paths of resistance, trails are etched into mountainsides, waterways are dammed by beavers changing entire landscapes, forests regenerate with the possibility of a predator nearby, all because a multitude of animals and organisms are responding to the ever present watchful, omniscient “eye” that even when out of sight is yet never out of mind, always framing their construct of reality. I’ve noticed in the training of protection and problem dogs that there is a qualitative difference in their temperament in the light versus the dark. I once had to wash out a prospective police dog once because his level of aggression went down too much on his first night training session. With problem dogs, sometimes they become more active as evening turns to nightfall because the human beams of attention are about to become dormant, but often they become mellow for precisely the same reason as they aren’t as likely to become the object of human attention and so they feel more at ease. What’s interesting about the dogs in this experiment is that they stole the food in the first place. So this wasn’t their first time at the rodeo and how they were trained wasn’t very good since the owner really only created what Ian Dunbar would call “an owner absent problem.” It doesn’t mean the dog is aware of the owner’s limited range of vision due to the darkness, just as it doesn’t mean that deer are aware of the hunter’s perspective because they increased their flight distance as the reach of human weaponry evolved from spears to high power rifles. Before Agi and I were married, she owned a German shepherd named “Justin” who used to sneak off the property if left out too long. When he was young and before I knew him, he would trot off during the day until one time Agi ran him down and chased him all the way home. After that it was almost exclusively after dark. So eager as I was to impress Agi with my training expertise, one evening after dark I contrived to be hiding outside and downwind of the property before she let him out. I was prepared to correct him as if I had appeared by magic as that was how I approached such problems forty years ago. About 15 minutes after letting Justin out and with me in position, Agi flicked on two banks of floodlights blasting the yard into near daylight and catching Justin out in the open just about to duck through a hole in a thick tangle of forsythia bushes. “So that’s where he goes.” I remember thinking. And yet, Justin didn’t miss a beat. He didn’t look up, he didn’t turn around, he didn’t pretend to be doing something else, in fact he gave no indication that he had any idea that the lights had just came on, that someone must be responsible for the lights coming on, and that he could now be visible to the person watching who had just turned the lights on. And needless to say he was very surprised to see me suddenly materialize from behind the Shagbark tree on the other side of that line of bushes. I regularly kept track of this phenomenon. I’d let my dogs out into the backyard and turn the light on to see if any of the dogs would notice. Over the many years I did this experiment, only one dog, Fee, looked up as if to take note. She saw me standing in the glass sliding doorway next to the light switch. Was it happenstance, did she hear the switch click or the floorboards creek as I stepped toward the door? Not a very good experiment I admit since I wasn’t controlling for all the variables, but still, only one. Think of what it takes for we humans to understand how the world looks to another being. They have to be able to speak to us and relate directly their experience. Or we have to dissect their sensory organs and see what range of stimuli they are able to detect. And as the philosopher Nagel asks, does any of our high tech scientific inquiry do us any good in understanding how the world looks to a bat using echo location? So while I think that this is a great experiment, I would like to see a more rigorous manner of examining interpretations. In my view, the most parsimonious interpretation of this experiment is that dogs who have learned to avoid humans, feel less pressure in the dark, i.e. access channel open. GO! Wow, this really put things into perspective for me !!! Thanks Kevin for another awesome insight. Thanks for your insight into this important topic. 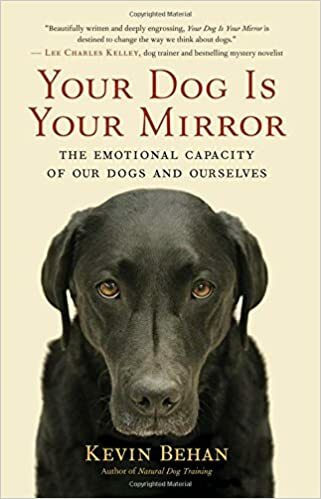 I read your book, Your Dog is Your Mirror, a few months ago and it inspired me to write on my blog site about how animals see us. 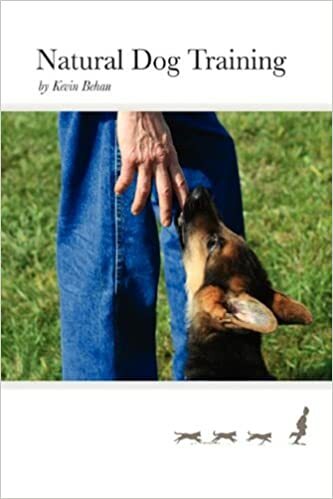 There seem to be so many misunderstandings about dog behavior. I tell people if you want to know your self better, pay attention to what your dog is showing you in their behavior. My blog post is called How your Dog Sees You and you can find it at the following link http://animals-in-spirit.com/how-your-dog-sees-you/.